The definition or meaning of the Arm Ball lies in the word “ARM BALL” itself. The word “ARM” itself suggests that the Arm plays a major role in generating this kind of delivery than compared to wrist and fingers. Since the Arm plays a major role and fingers plays a minor role, as a result of this the ball moves little bit quicker and skids directly into the batsman with out any turn and also drifts a little bit in air. 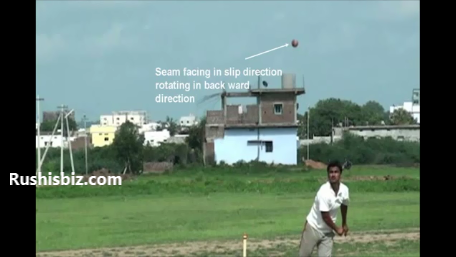 Arm ball is one kind of variation mostly seen in spin bowling especially in Off spin and Left arm spin bowling. It is one of the most oldest promising delivery in spin bowling for many decades. Arm ball is defined as the ball which generally pitches in and around the off stump line of a right handed batsman in a little bit fuller length and moves quickly or skids directly into the batsman with out any turn. Generally the Arm ball is a quick delivery in spin bowling. It can be bowled as quick delivery with out any flight and turn. It can be bowled as fast quick drifting delivery in fuller or yorker length. It can be bowled as flighted delivery with out any turn. And since the Arm plays a major role in creating this kind of delivery than compared to wrist and fingers, it is called as Arm Ball. In any kind of spin bowling generally the speed of the normal off break or leg break or slow left arm ball ranges between 70 to 95 kmph. In above kind of deliveries the wrist and fingers plays a major role in generating those respective deliveries. In Arm ball since the powerful Arm comes into the party or plays a major role in generating this kind of delivery, obviously the speed of the Arm ball would be little bit more than the normal kind of deliveries stated above. The speed of the quick Arm ball like ” fast quick drifting delivery in fuller length or quick delivery in good length with out any turn and flight ” generally ranges between 95 kmph to 110 kmph. And the speed of the flighted Arm ball in good length with out any turn generally ranges same as normal kind of deliveries like Off breaks, Leg breaks and slow left arms. HOW DO YOU BOWL ARM BALL IN OFF BREAK ? Before bowling a Arm ball, ” How to hold a ball or grip the ball ” is key. The reason to hold a ball with the seam in Arm ball is because the maximum energy of the arm can be utilized rather than holding across the seam. And there by resulting in maximum speed of the ball. 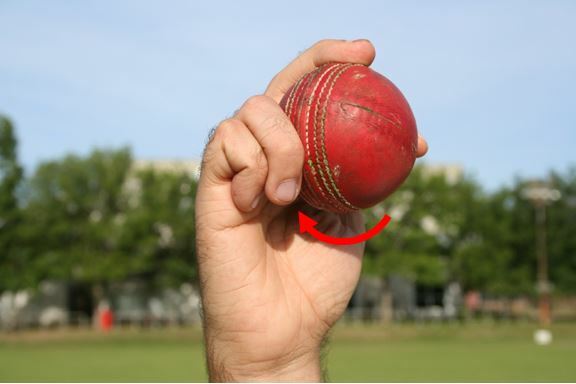 If you hold a ball across the seam the ball might get flighted in air and might not be as quick as compared to holding the ball with the seam. And also there is a chance for little bit turn. The reason for the ball to be not so quick in air is because the maximum energy of the Arm cannot be utilized when a ball is held across the seam. You can say simply this kind of delivery as a flighted delivery with a slight turn. So now after holding a ball with the seam facing towards 1st slip region, bowl it in orthodox style with your high straight arm action along with your fingers and wrist at the time of releasing point. Bowl it in such a way that your arm has to be high straight angled above 135 deg with your body, the wrist has to be at an angle of 135 deg with your arm in such a way that the back of the palm has to face towards behind you or towards long on region, the index finger and middle finger has to be adjusted, in fact should play a role in dragging or pulling down the ball in reverse or in back direction with the seam facing in 1st slip direction at the time of releasing point. 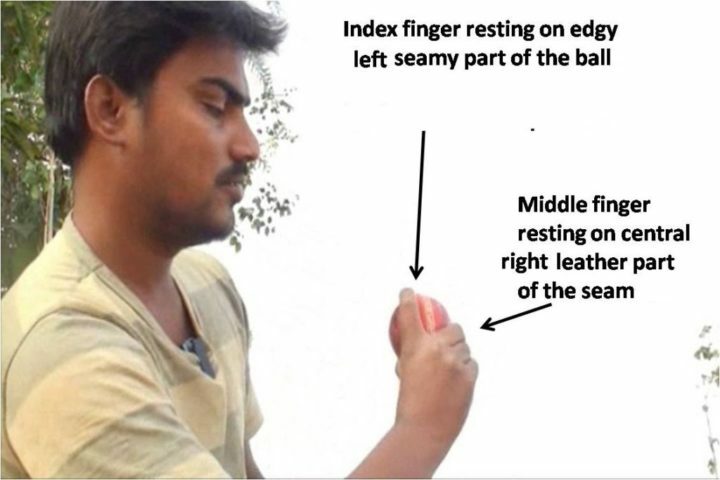 This phenomena is similar to fast seam bowlers bowling a out swingers who drags or pulls down the ball in reverse or in back direction with the seam facing in 1st slip direction. While bowling the Arm ball, the fore and middle fingers especially the fore plays a major role in pulling down the ball in back or in reverse direction. So here when you observe the rotation of the ball very carefully after the ball has been released from hand, the ball rotates in back or reverse direction with the seam facing towards 1st slip direction. These things can be observed very easily in slow motion replays in Test matches. After the ball has been released, depending upon the shiny side of the ball and other conditions, the ball drifts in air from left to right or vice versa making the batsman more difficult in predicting the ball ” where actually it pitches ” (Generally if the shiny side of the ball is on right side, it drifts from left to right, similarly to left side). After pitching, as it is a Arm ball, it doesn’t fly much, it doesn’t turn much, it will be quick through air and moves or skids directly into the batsman. 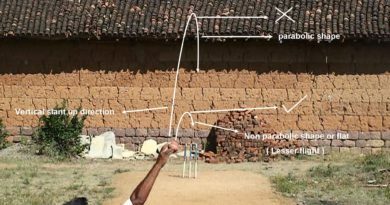 Similarly the above complete theory can be applied to slow left arm spinners. Therefore since the Powerful Arm plays a major role in generating this kind of quick delivery in spin bowling it is called as ‘ARM BALL’. Normally it is a quick delivery with less turn and less flight. The powerful Arm plays a major role. It also drifts in air little bit, since it has the same phenomena of seam bowlers bowling out swingers. Its speed generally ranges between 95 to 110 kmph. Since Arm ball is nearly a straight delivery or a delivery with slight turn or a delivery which is quick through air, there are more chances for the batsman to get LBWs, outside edged and also get bowled. It is bowled in little bit fuller length. The good length for spin bowling ranges from 2 to 6 yards, but if we go little bit deeper in to the concept the bowling length for Arm Ball would be slightly different when compared with Off Break or Leg Breaks. So why the lengths for Arm Ball is slightly different from Leg Breaks or Off Breaks. Let us discuss. When Normal Off Break is bowled (generally) the ball pitches in and around the off stump line, then turns into the batsman or towards leg slip region. As long as it turns enormously the length ranging from 2 to 6 yards is always good for Off Break bowling. And even i can assure you the length ranging from 0 to 6 yards could also become good if the ball turns even more enormously. From above you might get the sense, the length for Off Break depends upon ,” How much does the ball turns after pitching “. In fact ” the spin of the ball after pitching decides its length whether good or bad”. And also don’t forget, the length for Off Break not only depends on “How much does the ball spins after pitching” but also the flight , the change of pace , the speed, the skidding factor, the fast drifting in air factor and other factors. 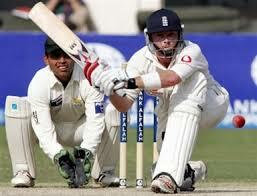 We know that Arm Ball moves quickly or moves straightly or skids directly into the batsman with out any turn. And also its speed is slightly little bit more than Off Break. The three factors moving straight to the batsman, less flighting factor, speed factor effects its line and length. So when you bowl a Arm Ball on a length ranging from 5 to 6 yards or above 6 yards , as the ball moves straight to the batsman, not a flighted delivery and little bit more quicker, then this length becomes shorter length for the batsman. 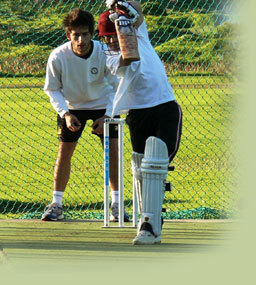 There by the batsman can easily defend or play a shot. So it should be bowled in between 2 to 5 yards . That is little bit fuller in length. Even more good length for Arm Ball could be 2 to 4 yards. Not only the length , the line is also very important for Arm Ball, because if you bowl in and around the Off stump line and length (2 to 4 yards), as it moves straight into the batsman, not a flighted delivery , there are more chances for bowler to get outside edged, get them bowled or get them LBWed. These length factors are also applicable to and similar to Off Spin weapons such as Doosra, Off Top spinner, Slider, Change of pace etc. The other very important factor for bowlers is Off Break bowling. By bowling just Arm Ball ‘s you don’t get wickets . The key is always Off Break as it is said earlier. Bowl continuously and continuously Off Break at least 2 to 3 in a row , then shift on to Arm Ball that to in line and length (2 to 4 yards) then it effects you as a bowler and gets the real meaning for Arm Ball . Similarly to Arm Ball ‘s the Off Top spinners, the Doosras, Sliders, Skidders, Shooters cannot be bowled continuously, the Off Break has to be always play a major role and then shift on suddenly to these weapons, that to in line and length then it effects you as a Good Bowler and gets the real meaning for these weapons.